The Vatican defended the Pope today, insisting he would not be intimidated by 'petty gossip' about the child abuse scandal during a special Easter Sunday statement. 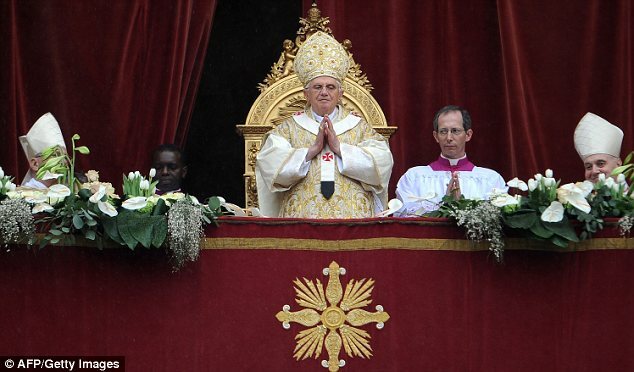 Cardinal Angelo Sodano gave a speech of solidarity at the start of the Easter service in Rome in what is believed to have been the first time in recent memory protocol at the ceremony has been changed. 'Holy Father, the people of God are with you and will not let themselves be influenced by the petty gossip of the moment, by the trials that sometimes assail the community of believers,' Sodano said. 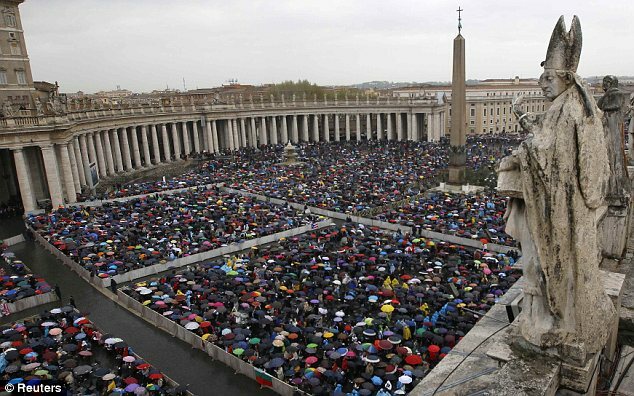 He told the Pope 'the Church is with you' and hailed Benedict as a 'solid rock' that holds up the Church, prompting thousands in the rainy St Peter's Square to cheer. 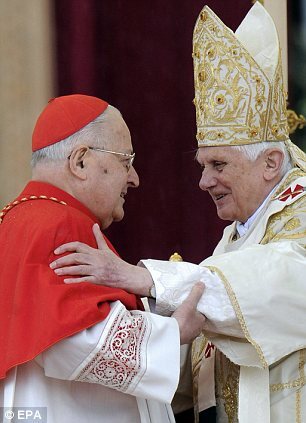 The change in protocol shows how much pressure the Vatican is feeling over the scandal and claims of a possibly cover-up that have inched closer to Pope Benedict himself. 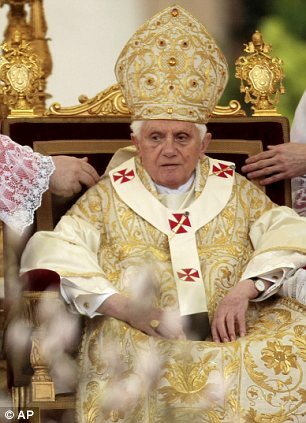 In his own Easter address hours later, Benedict looked weary at times and did not mention the scandal. It came as senior clergy in the UK used their Easter sermons to acknowledge the guilt the Catholic Church feels and apologising on its behalf. 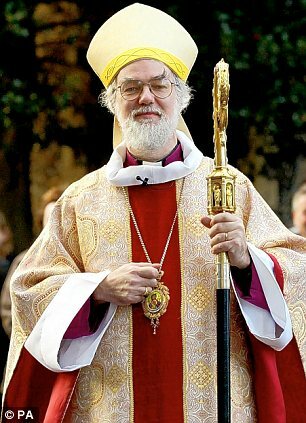 Archbishop of Canterbury Rowan Williams, who yesterday sparked a storm for declaring the Roman Catholic Church in Ireland has lost 'all credibility', steered clear of the row today. Instead, he spoke about cases of 'bureaucratic silliness' over displays of religious symbols, such as nurse Shirley Chaplin who was asked to removed her crucifix necklace. But the scandal overshadowed services elshewhere with Archbishop of Westminster Vincent Nichols admitting 'serious sins' had been committed in the Catholic community. 'For our part, we have been reflecting on them deeply, acknowledging our guilt and our need for forgiveness. This is the journey of Holy Week. Indeed, to appreciate the message of this great Christian feast we have to begin with our own sin and shame,' he said. Head of the Church in Scotland Cardinal Keith O'Brien said: 'Many evils have been committed throughout the world, particularly with regard to the sexual abuse of children and young people. He added: 'Crimes against children have indeed been committed and any Catholics who were aware of such crimes and did not act to report them brings shame on us all. 'We can take no comfort from the fact that only a small percentage of priests committed such crimes - the impact of their sinful acts is very large - their actions harmed the lives of their victims, caused great hatred to be directed at their innocent brother priests and left ordinary Catholics demoralised and confused. 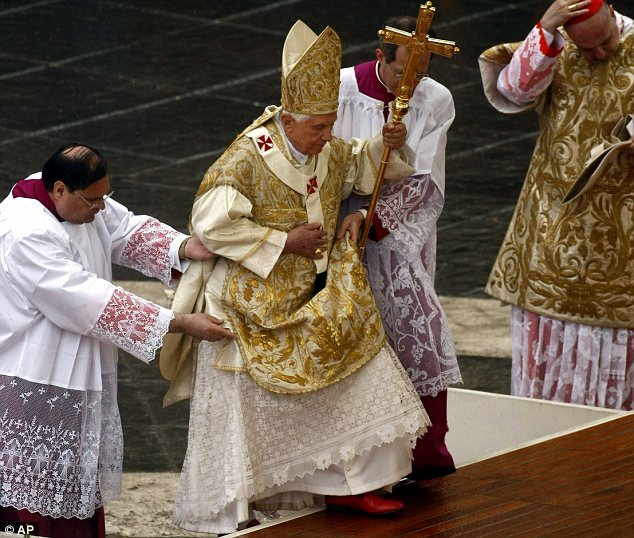 'One might say that there has been a great "public humiliation" of the Church, as in some way or another we realise that we have not been as alert as we should have been to the evils being perpetrated around us, whatever our particular position. Today, Father Raniero Cantalamessa apologised in an interview with an Italian newspaper. 'If - and it was not my intention to do so - I hurt the sensitivities of Jews and victims of paedophilia, I am truly sorry and I ask for forgiveness,' he said.